Support your pets internal organ function with high moisture food. High moisture foods, such as canned food hydrates to the body, combating dehydration that compromises the bodies’ health. Canned food is an easy way to support your dog and cats needs for higher amounts of animal protein in their diet. Carbohydrates and starches are not necessary in the production of canned food as they are for dry extruded foods. The result is a higher amount of animal protein for your carnivore friends. One can of food will go a long way. Make a perfect meal by adding a spoonful or two + warm water to your pet bowl of dry food. Both you and your pet will both feel great about this healthy meal! 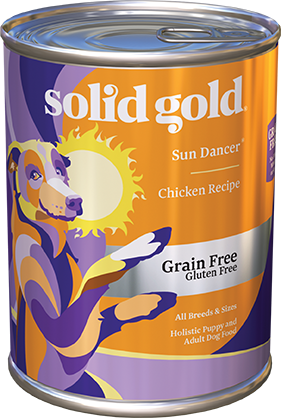 Solid Gold Health Products For Pets introduces two high protein, grain-free and gluten-free canned dog foods. Chicken Recipe and Beef Recipe can be fed as a sole diet or as an excellent accompaniment to Solid Gold Sun Dancer™ and Barking at the Moon™ dry dog foods. Chicken, Chicken Broth, Dried Egg Product, Cassia Gum, Carrageenan, Guar Gum, Flaxseed, Potassium Chloride, Salt, Cranberries, Blueberries, Choline Chloride, Zinc Proteinate, Iron Proteinate, Vitamin E Supplement, Copper Proteinate, Manganese Proteinate, Sodium Selenite, Thiamine Mononitrate, Cobalt Proteinate, Niacin Supplement, d-Calcium Pantothenate, Vitamin A Supplement, Riboflavin Supplement, Biotin, Vitamin B12 Supplement, Potassium Iodide, Pyridoxine Hydrochloride, Vitamin D3 Supplement, Folic Acid. Beef, Beef Broth, Dicalcium Phosphate, Cassia Gum, Carrageenan, Guar Gum, Dried Egg Product, Tricalcium Phosphate, Flaxseed, Potassium Chloride, Salt, Cranberries, Blueberries, Choline Chloride, Zinc Proteinate, Iron Proteinate, Vitamin E Supplement, Copper Proteinate, Manganese Proteinate, Sodium Selenite, Thiamine Mononitrate, Cobalt Proteinate, Niacin Supplement, d-Calcium Pantothenate, Vitamin A Supplement, Riboflavin Supplement, Biotin, Vitamin B12 Supplement, Potassium Iodide, Pyridoxine Hydrochloride, Vitamin D3 Supplement, Folic Acid. Con: Only complaint is having to find a can opener!!! Review: This is a great food. I deal with a lot of Foster Dogs that come to be with poor nutrition. Using this mixed with Dry Solid Gold gets them on a health path very quickly and it also makes it very easy to give meds. Review: I love this product and I love to recommend it to my clients. I like the consistency and dogs seem to like the taste. When I’m making ’stuffed Kongs’ for my dogs I like to add some of the Solid Gold canned food to the mixture (mixture is whatever I have available, it might be dry dog food, treat crumbs, vegetables or leftover people food) with a little water. the Canned food adds flavor and helps to hold everything together when I freeze the KONG. I like this better than peanut butter or cheese whiz, because it’s healthier with less fat. Review: I feed two golden retrievers, age 6, in excellent health. One has some mild ’itchy issues’, and this food seemed to help with that. My dogs loved that taste. They clearly liked the beef version better than the chicken, but eagerly ate both. My dogs are excited to try this month’s products! Review: Recently Claire had the opportunity to try Solid Gold Grain-Free canned dog food Chicken Recipe. Even though we sell our own dry dog food, it was important that Claire have canned after her dental surgery. She enjoyed it very much and has asked for more. She will be undergoing more surgery and needs to eat canned food only for a while. She insists that it’s Solid Gold Grain-Free canned dog food Chicken Recipe. 2 Features: Grain Free, good ingredients. 2 Benefits: Extremely palatable! Dogs LOVED it!! Review: I used the high protein canned food as an amendment to their kibble. The food smelled good (some can really wreak!). It was easy to incorporate. My dogs LOVED IT!! They licked their bowls clean and went back and licked them again. Hard to tell in 30 days what long term benefits were achieved but my older dog seemed a bit more energetic! We will definitely use it again. Thank you SG!! 2 Benefits: The ”ladies” really love it and it works well for sensitive stomachs. Con: The downside to any canned dog food can be its unappetizing, soupy appearance. We mix it with a high-quality kibble and our dogs love it. Review: Over the last five years, we’ve fed Solid Gold Sea Meal to our Golden Retrievers. It’s been fantastic for their coats. Solid Gold products are high quality and do very well for our dogs. 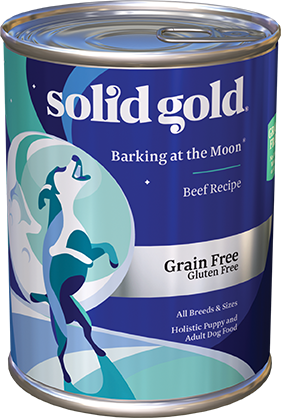 Solid Gold’s Beef Recipe canned dog food continues the tradition of high-quality ingredients and good nutrition. Review: My dogs both loved this food. I like to use cans to give my dogs variety and also to treat them. This food is a great option….quality ingredients, high protein, and affordable. I also like that the food comes out of the can easily as I hate having to dig food out of the can with a spoon. Review: My two 14-year old Papillons LOVE this canned food. I love that it’s grain free. My only complaint is that they eat it too fast. We tried both chicken and beef flavors. Both were equally well received. Review: Our dogs at Animal Intuition, Emily & Bodi, gave the new Solid Gold High Protein Beef Recipe a try recently. Now, while they are both very food motivated, Bodi is quite picky about what he eats and Emily has a sensitive stomach. They both LOVED it and no tummy aches either! For years, any dog I have had that has digestive issues the Solid Gold brand foods have always worked well. How quickly they learned what the sound of the can opener meant. I liked the food because of the nutritional value and health benefits, my dogs loved the taste. We both enjoyed the fact that I could sneak in supplements easily and the dogs didn’t even realize they were there. 2 Benefits: His coat is soft and glistens. He waits for his canned food. Con: I looked at price and is expensive, so I have been adding a bit every day to his dry food to make it last a while. Review: My dog waits for the fridge to open, to see if it is that time of day for his canned food fix. I mix with his dry food and he spits his dry food out on the ground and wants nothing to do with it if he has the canned food. Staff comment: You can make canned food go a long way by added a spoonful to the dry food. Add hot water and mix together with the dry and canned, making a “soup” or “stew”. This mix will have your dog happily eat his whole healthy meal. Review: My dogs have never eaten canned dog food. When I first gave them some of the product they were hesitant, and gave me questioning looks regarding what was in their bowls. They sniffed it, they carefully licked it ….seemed to find it tasty and acceptable and ate it up. My girl was quicker to like it than my boy. They both seemed to prefer the chicken over the beef. This also seems to be true with dry foods. 2 Benefits: My Dogs Coat Look Awesome and My Dogs with Allergy issues had Great Skin and Coat!! Con: I cannot find ANY Disadvantage to this food. i Love absolutely everything about this food. So Did my Dogs! ages from weeks old to 16 years. I have small dogs now and they range from 3 lbs to 19 lbs. I have a lactating mom too. I fed this food to everyone and they ALL jumped right in and quickly gobbled their food down. I am a big proponent of grain free and also believe in a varied diet. This was the perfect fit for us. The puppies did great on this food as their first exposure to real food and my older dogs without teeth loved the texture. I have a dog with itchy skin and her skin looked amazing after a month on this food. I would encourage anyone with dogs of any age to feed Solid Gold High Protein food. My picky eaters loved it! This is a Great addition to my dogs diet! Review: All my pets, especially the dogs, really loved it. I also noticed that their poop seems more solid, and better formed. 2 Benefits: Dogs love taste, great for getting dogs to take meds! Review: We have a mini dachshund who is prone to injuries. Soon after taking the canned food home, he needed to take meds for a foot injury. We hid the pills in a ”meat ball” of moist food–he gobbled it up. Our other two dogs thought they were getting a treat (had to give them some moist with their dry kibble to not feel left out). Love the great ingredients! 2 Benefits: The dogs loved it . Gave them more energy. Review: Our dogs loved the food. We had mixed in the wet food with the dry kibble we had for them. They seemed to be more excited for meals with the mixture. They seemed to have more energy. One of our dogs is a bit of a finicky eater. With the mixture we used he ate very well. Review: These new canned foods are a great way to add in a good source of protein, especially while traveling. I like add this food to a kong-type chew toy and freeze, keeps the dogs nice and busy. My dogs get very excited when they see me pulling out one of these cans to feed them. 2 Benefits: My dog loved it added to his dry food, and doesn’t give him gas !!! Con: A little spendy but mixed in with dry food saves on giving him the whole can !! Review: It was a great addition to the dry food I am feeding him which is barking at the moon. He really enjoyed it like it was a treat. I was afraid at first because he gets gas easily but to my surprise he was fine I started off with small portions but now I will give up to half a can. Will definitely purchase it again as well as recommend it. Con: 1) It was a bit smellier than I thought it would be but manageable. 2) My pups did have a problem with gas the next day but it cleared up pretty quickly. Review: All in all, a great choice to add into the wet food rotation! Review: Although the smell was a little off putting to me – My dog LOVED it! Review: We’ve only had Cassidy on Barking at the Moon 4 days, but he’s much more enthusiastic about eating it than he was about his last canned food, and we wanted something that would help improve his allergies, since his little nose seems to constantly run. Staff Comment: Solid Gold food is excellent for allergies. Add in the Solid Gold Seameal Supplement Powder with the food and you should expect amazing results. Seameal will boost the immune system with the trace minerals it provides. Every meal is a ”holiday” experience! 2 Benefits: The dogs are thriving, gobbling up their dinner without hesitation with excellent healthy shiny coats. Review: We feed all of our pets Solid Gold dry food and have for the first time added wet food to their food as a supplement. They love their food and have benefited in a number of ways. Our Golden Retriever/Shepherd mix has allergy problems and the combo of the dry and wet food has really helped keep her itch free and happy. Our 2-yr old Doberman had extensive health problems when we adopted her including a dry coat and digestive issues. Now, her coat is a high glossy black and she is a beckon of health. Our vet says we are doing a great job with them and we feel like Solid Gold products have been the key to keeping all our pets healthy and happy. We are big advocates of Solid Gold products in our household and would rather spend a few dollars more to ensure our pets are getting the nutrition they need. Review: Great food, dogs loved it. It smells pretty bad, I don’t know if I would feed it all the time cause of the price and I have 3 big dogs. 2 Benefits: Love the consistency of the food. Review: I was able to add it to the dry foods of six dogs, making it an exciting meal for them and there was still enough for a meal for the cats.